Protection against rear-end collisions. Automatic. Smart. Daylight visible from over 2 km away! The only automatic brake light for bicycles that re-calibrates going downhill. Mountain bikers rejoice! I would personally love to see bike racing as safe as possible while still keeping it fun and competitive. Your light system is a perfect example of a capability that would further the cause. Immediately I was really impressed. It adds one more element. It’s not just about how bright it is or how great the strobe is, it’s actually the decelerometer. Just from a rear light standpoint, it beats pretty much everything I’ve seen in the price range. It’s a phenomenonal rear light and the fact that its a brake light too just puts it over the top for me. From a safety standpoint, I think its fantastic. You are cycling for fitness, to ride with friends, and escape from the grind. You should be able to look forward to the road ahead of you and not worry about being hit from the rear. You need an automatic brake light that measures g-force and turns itself on when you brake or slow down. Protect yourself against rear-end collisions from other cyclists and vehicles. We like keeping fast-paced people safe. 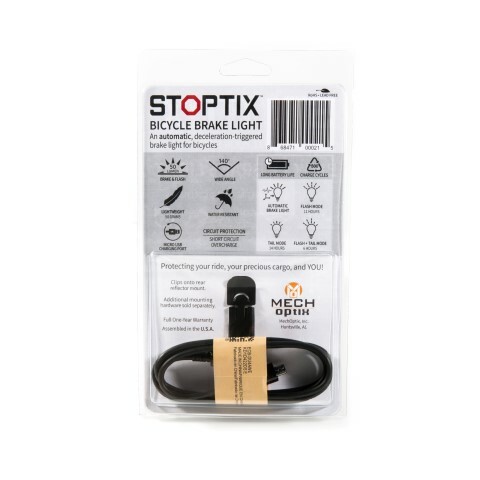 Our customers liked our Stoptix Automatic Brake Lamp for motorcycles and automobiles and asked if we could make one for bicycles. What a cool idea! We did and it is unique. Water resistant and rechargeable. And like our automotive lamp, the bicycle light automatically comes on when you slow down or brake, not if you bounce around or are on a bumpy road. Would you like long battery life and a wide viewing angle? We thought so too, so we threw it into the design. We also made it large, even beginning to resemble a motorcycle light to make you more visible -- the more you look like another vehicle, the more other drivers will treat you carefully.